anglo-saxons, anglos, biology 101, biology and behavior, biology matters, blood feud, clannishness, different peoples is different (duh! ), emile durkheim, england, english, europe, europeans, family honor, feuds, general theory of the west, henry harpending, henry i, hmpf!, homicide, honor, inbreeding, individualism, manuel eisner, mating patterns matter, medieval europe, my hobbyhorse, normans, outbreeding, penguin alert!, peter frost, relatedness matters, the leviathan, the outbreeding project, the state, tl;dr, vengeance, violence, we've always been at war with austrasia, wergeld, what's this hbd business all about anyway? pinker cites daly and wilson (1988) on this who, in turn, cite hurnard (1969). there is also green (1972). see also The Aristocracy of Norman England (2002), pg. 243.
the only problem with this picture is, as was discussed on this blog in a previous post, there is good evidence that the kindred in anglo-saxon england — the importance of kinship, in other words — was already beginning to disappear (in southern england, anyway) in the early 900s, or maybe even the late 800s, a full two hundred years before henry i and his coroners showed up on the scene. so, in england anyway, the individual didn’t become “largely free from collective ties of kinship and ethnicity” thanks to the state. anglo-saxon individuals were already on their way to becoming free from the collective ties of kinship before the state stepped in. that “something” that i was referring to is, of course, the avoidance of close cousin marriage — or The Outbreeding Project, as i like to call it. (i guess i should really call it The European Outbreeding Project or The Norwestern European Outbreeding Project.) the importance of kinship — extended families and kindreds — disappeared in large parts of northwestern europe, because northwest europeans quit marrying their close cousins, and the ties (including genetic) between individual northwest europeans and their extended family members simply loosened. loosened to the extent that, after several hundreds of years, extended families and kindreds just didn’t matter to people anymore. and, so, kindred-driven activities like feuding ceased and homicide rates decreased markedly. 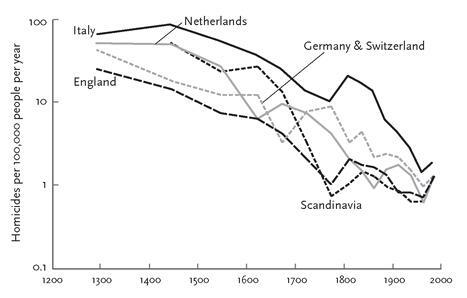 the dutch — thanks to having been a part of frankish austrasia — and the southern english (especially the ones in kent) — thanks to being heavily influenced by the franks just across the channel — began avoiding cousin marriage very early in the medieval period, probably already in the 600-700s (see “mating patterns in europe series” below ↓ in left-hand column — also more on medieval england and france). the germans weren’t far behind, especially since the franks had so much influence in what would eventually become germany over the course of the medieval period (see the ostsiedlung). the scandinavians lagged behind since they were comparatively late in adopting christianity (and, therefore, in adopting the cousin marriage bans). and the italians were very late since they mostly did not have manorialism (which reinforced the cousin marriage bans). the italians, in fact — especially southern italians — kept marrying close cousins up until very recently. replace “liberated from its sacred obligation to the group” with “more and more outbred” and you’ve got a nice, little sociobiological theory there! in anglo-saxon england, then, the kinship groups and their “culture of honor” (feuds, etc.) declined before the state got involved in safeguarding the lives of individuals. meanwhile, in medieval italy, the culture of honor persisted despite the presence of states that punished violent offenders. the difference, of course, is that italy — especially southern italy — barely ever joined in The Outbreeding Project, whereas england was one of its leading nations. ← Previous Post happy anniversary! James C. Scott cites to Jared Diamond, citing to Pinker, claiming the state imposed peace on uncivilized, violent savages. First, it does not follow that the state, by curtailing ‘private’ violence, reduces the total amount of violence. As Norbert Elias pointed out more than half a century ago in The Civilising Process, what the state does is to centralise and monopolise violence in its own hands, a fact that Diamond, coming as he does from a nation that has initiated several wars in recent decades and a state (California) that has a prison population of roughly 120,000 – most of them non-violent offenders – should appreciate. Second, Hobbes’s fable at least has nominally equal contractants agreeing to establish a sovereign for their mutual safety. That is hard to reconcile with the fact that all ancient states without exception were slave states. The proportion of slaves seldom dropped below 30 per cent of the population in early states, reaching 50 per cent in early South-East Asia (and in Athens and Sparta as much as 70 and 86 per cent). War captives, conquered peoples, slaves purchased from slave raiders and traders, debt bondsmen, criminals and captive artisans – all these people were held under duress, as the frequency of state collapse, revolt and flight attests. As either a theory or a historical account of state-formation, Diamond’s story makes no sense. This business about the importance of outbreeding is most interesting. I think we really do need genetic analysis to determine the levels of “genetic fracturing” across these populations. I think ROH would work well. Another option is to do IBD comparison on European populations on pairs of individuals who are of equal level of pedigree. For example, you could compare 1st, 2nd, or 3rd cousins in England and see if they are less related to each other, on average, than 1st, 2nd, or 3rd cousins in Southern Italy, as your hypothesis would predict. Looks like something for you to mine, despite the fact it only had a smallish sample of <150. I will add for the IBD, you would want to compare within and between family to see in individuals within the populations that should be more inbred are more related to their family members with respect to the overall level of genetic relatedness of the population as a whole than individuals from populations which should be outbred. yes! excellent. thank you! (^_^) i’ve been thinking along the same lines myself as, yes, cousins in inbred societies ought to share more roh (or ibd segments) than in outbred ones — i’ve seen one example where this has been shown to be the case (for roh). maybe there are more examples out there…i should look around! i’ve been thinking, too, that it’s next to impossible, maybe, to compare, say, the roh in europeans or africans with native americans, etc., etc. got bottleneck and other problems between the populations that…well, i don’t know if there’s any way around them (any way to calibrate for them, for instance?). Fascinating, however it doesn’t necessarily follow that out-breeding will result in the exact same behavior set for any given population once they are thoroughly out-bred. It also still makes me wonder what happened that started it all. Who first got the idea that marrying cousins was bad? I have this crazy vision of some sheep herder/breeder in 600BCE Greece having a torch light up over his head. Heck, this knowledge could have cropped up a few times in history only to be lost, like for instance ancient Sumeria, persia, china. it makes me wonder if it comes up in waves… Out-breeding brings brains which allows innovation that grows population (among other things) until something (maybe the competition inherent in higher population? cross migration of less fortunate in breeders?) causes people to lose social trust and keep it in the family more, leading to regression/collapse until some other marginal society starts out breeding and everything starts over again. Is Austria behind the Hajnal line? Ancient Greeks (including the Athenians) regularly married their cousins, and uncles their nieces. Even marriage between half-siblings was not uncommon. We also have evidence for a high rate of full brother and sister marriage amongst the Greek population of Egypt during the Roman period. You may be interested to know that a Cambridge guild, the Guild of Corpus Christi, established one of the Cambridge colleges. I’ll let you guess which. *If* that created a situation where people started to marry within their deme – to cement alliances – then you’d get a process where over multiple generations the old clans were broken down and new deme-based clans formed instead but in the *middle* of that transition what would you get? By a strange coincidence you’d get the golden age of Athens. GW, this is the same anon as before. I’m well aware of what Cleisthenes did to the clans but marriage between close relations continued steadily into the golden age of Athens, so there doesn’t seem to have been too great of an effect if any. Just to give some examples: Pericles’ first wife (by whom his sons were born) was his cousin, Plato’s mother married her uncle and had two children by him (after the death of Plato’s father), Alcibiades parents were first cousins and his daughter married her first cousin. Thucydides’ parents were also first cousins. The golden age of Athens is so soon after the creation of the demes that we can hardly attribute the former to the latter in terms of clannishness, especially when the practice of cousin marriage (as well as nephew-niece and half-sibling marriage) continued throughout that period. The Greeks were always very concerned about the in-group vs. the out-group, on multiple levels. Their civilization was also arguably the highest point in the west. On a slightly different note, that chart is misleading in that (as far as I know) it isn’t adjusted for age. Life expectancy doubled from 1800 to 2000 and senior citizens don’t kill very often. So it doesn’t really show how human behavior changed during that period. There was also better medicine and emergency health care that turned murders into assaults. It’s also interesting that even with these factors concealing the brutality, the rates still increase around the time when large scale multiculturalism was introduced, around 1980.
yes. eisner does address these in the paper. yes, although that was a sort-of special, odd case — a small minority spread out throughout that country trying to hold on to its property/wealth. i think that was a practice that arose there in egypt (perhaps influenced by the knowledge of how the pharaohs married?) which doesn’t reflect back much on the greeks in greece. no! absolutely not. i agree. (^_^) there will inevitably be a whole host of other — and varying — selective pressures on different populations, so you’re gonna get different end results. there might be others, too. and, again, some or all of these might be wrong! i think the genetic unravelling (thnx to outbreeding) and the selection for — whatever — greater individualism, greater collectivism across the larger society, etc. (higher iq? see: the naturalist philosophers) — take a little longer. but not forever! cleisthenes and his reforms were, i think, an attempt to address the problems that the renewed increase in inbreeding were bringing to athens — corruption, favoritism by “the families” towards their family members, etc. i doubt his reshuffling of the demes helped much. not if everyone carried on (or even, perhaps, increased) the inbreeding. austria’s one of the border countries wrt the hajnal line, so presumably the further east you go in austria, the less hajnaly it becomes. Michael Lotus, I can’t tell how much you support Scott’s view, but let me weigh in on its weaknesses. However much we wail about state violence, the homicide rate, however defined, is still far less over the last couple of centuries. Started wars in the 20th C…oh well, horrors. Nothing like that ever happened before, did it? I recommend Lawrence Keeley’s War Before Civilization: The Myth of the Peaceful Savage. The graph is, as our hostess points out, logarithmic, and the decrease in violence is profound. We live in a gentle age. So too with Californian incarceration. You might convince me that the rate is too high. You can’t convince me that it bears remote resemblance of the violence of any societies before 1900. And before 1500 it’s just laughable. Rich societies imprison because they value life. Poor societies just behead them. Staffan, there’s something in what you say, but the doubling in life expectancy comes largely from improved infant mortality. Preschoolers also commit few murders, even in Malmo. Sisyphean – the early Christian Church expanded the Hebraic circle of who one could marry who. Whether one thinks they had figured out a dimly understood secret or were simply trying to undermine competing societal authorities, the practical effect was the same. As to the original post, a virtuous cycle is certainly possible. If one trusts the state a bit more, one feels less compelled to marry for protections and conserving clan assets, and freer to travel a few towns over and marry for money, or at least opportunity and solid virtues like intelligence, loyalty, thrift, or hard work..(Beauty and charm would have to wait until the next phase.) This in turn would reduce the opposition folks would have to government takeovers of justice. Or even just an increase for random reasons. Under System A, there were 17 possible brides for you. Under System B, you lose half of those as being too close, but gain another 30 possibles. Even throwing darts, there’s going to be less cousin marriage. My intuition is that diminishing strength of kinship ties in S England is overstated in the popular mind due to cultural ‘object-field’ focus. There’s nothing funny, quirky or interesting about regular folks doing regular stuff (in the blurry ‘field’ as it were). Hence in, say, Wodehousian, Wilde-ian, or Coward(ly?) comedy the subjects (objects) ALWAYS loathe, despise or dread their nearest and dearest, while assuming an air of benign indifference towards strangers not actively plotting against them. Something about exceptions proving rules… now where have I seen that? Sure but which close relatives? If there was even a partial switch to marriage alliances within the deme rather than within the original clans then even if they went from cousin marriage to cousin marriage with just one break in the chain that might be a very dramatic (if temporary) phase of outbreeding. For example two brothers whose kids would normally marry their cousins within the clan are instead married off to people within the deme and then the children from that go back to marrying their cousins in their new deme-based clan. Assuming this process happened but not overnight then that might be 4-8 generations? 3-6? 6-12? I’m inclined to agree on balance but i wonder. If there were parallel coincidences in India and China before periods of innovation then that might sway it. By this i mean if not every family switched from their old marriage clan to a new deme based marriage clan in one go but over multiple generations. It does seem a bit fast otherwise. Perhaps because, in their isolation, there were none, or few, to marry who weren't their cousins.